The Department for Transport has announced considerable success to date for its recently rolled out HGV road user levy. Launched in April, the new levy focuses specifically on foreign hauliers operating in the UK and was introduced in a bid to level the playing the field for UK-based and overseas companies. To date, £17 million has been raised through this additional taxation on foreign road users, with 618,000 levies purchased over the last four months, relating to 112,000 vehicles by firms operating in 76 countries across the globe. Government figures show that 95 per cent of HGV operators are now complying with the new levy guidelines, with the money raised so far enough to enable the repair of up to 320,000 potholes on routes up and down the country or to keep 170,000 street lights maintained for a full year. Meanwhile, roadside checks by DVSA officers have already resulted in 850 fixed penalty notices for vehicle operators who had failed to comply with the new levy rules, resulting in an additional £250,000 raised. Transport minister Robert Goodwill commented: "Before the levy was introduced, we had a ridiculous situation where foreign HGV drivers could fill up their tanks on the continent, pick up business in the UK and return to the mainland without even buying fuel – without giving a penny to help maintain our roads. "Meanwhile, British hauliers were effectively operating at a disadvantage. I'm glad to see this levy has addressed that imbalance." 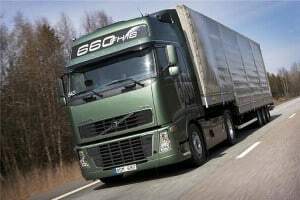 Responding to the announcement, James Hookham of the Freight Transport Association added the organisation has argued for several years that foreign HGV operators should be paying more to use the UK's transport network and it is therefore a positive development that this new system is addressing the issue. By doing so, the move has helped UK operators to compete more evenly with their overseas rivals.